Visiting Harare, U.N. Assistant Secretary-General for Political Affairs Tayé-Brook Zerihoun says he is aware of the issues the opposition had raised regarding the upcoming July 30 election that they want the Zimbabwe Electoral Commission to address. 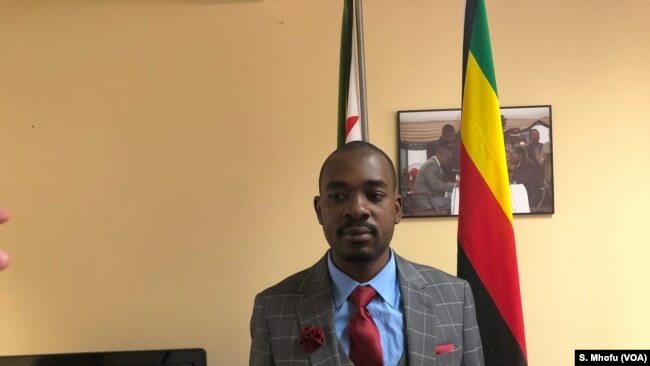 Nelson Chamisa, the president of Movement for Democratic Change Alliance says his party has not received the official voters roll from the Zimbabwe Electoral Commission, 17 June 2018. The U.N. official’s visit to Zimbabwe came as opposition parties are complaining the Zimbabwe Electoral Commission has not given them them the voters roll. They want to check that list for possible ghost voters, something that has been an issue in the past. Some parties said they failed to register for July 30 polls because of the commission’s refusal to hand over the voter registration list. On Wednesday, Jameson Timba, the chief election agent of the main opposition party, the Movement for Democratic Change Alliance, issued a statement saying the Zimbabwe Electoral Commission had “failed to meet its legal and constitutional obligation to provide election materials timely,” including the voters roll, and he urged the body to apologize to the people of Zimbabwe. FILE – Priscilla Chigumba, the chairperson of Zimbabwe Election Commission, speaks to reporters in Harare, June 14, 2018. 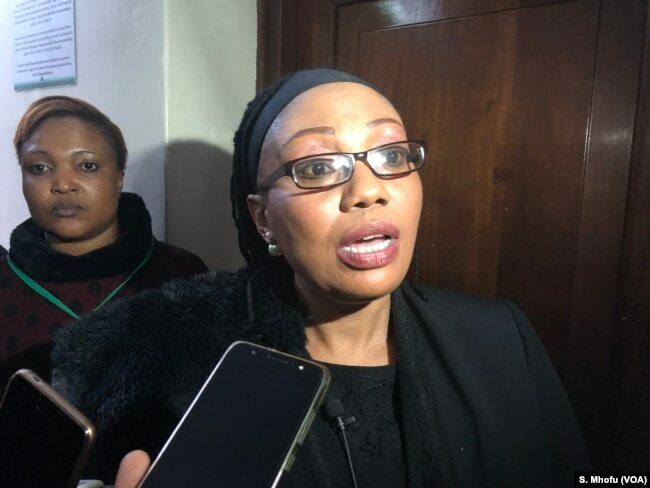 Earlier this week, Zimbabwe Electoral Commission chairperson Priscilla Chigumba said despite complaints from the opposition, “nothing short of an earthquake” would stop the election pitting President Emmerson Mnangagwa and 22 other presidential contestants. 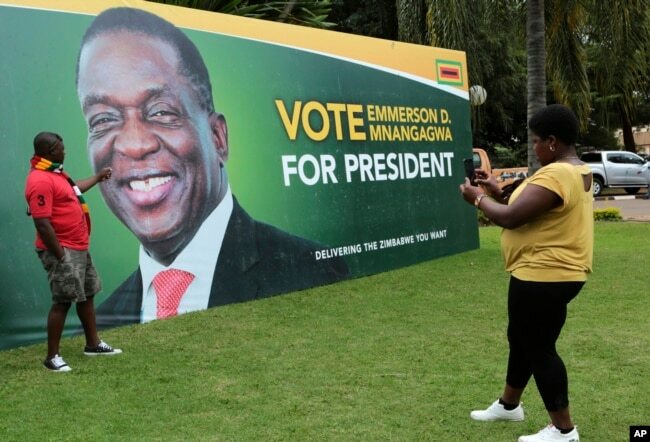 FILE – A man has his picture taken in front of an election campaign poster of Zimbabwe President Emmerson Mnangagwa portrait, in Harare, May, 4, 2018. The U.N. official’s visit provided some assurance that the international community is watching. ZEC has just failed to produce a verified voters’ roll, where in the world has it been possible to hold free, fair and credible elections with no verified voters’ roll? In third world countries, with very weak public institutions organisations like the UN and their officials have always tended to side with the rich and powerful knowing no one will ever hold them to accord. And you serious think that “these issues to be handled and discussed” can be meaningful resolved now six weeks before the elections when nothing has been done in the last five years? How naïve and gullible some of these buffoons can be! After 38 years of gross mismanagement and rampant corruption that has pushed unemployment to the dizzying height of 90% and left ¾ of our people living on US$1.00 a day, Zimbabwe cannot afford another rigged election and more of this misrule. Buffoons like Tayé-Brook Zerihoun can afford to be naïve the people of Zimbabwe cannot!